Musings on Markets: Stream On: An IPO Valuation of Spotify! In the last few weeks, we have seen two high profile unicorns file for initial public offerings. The first out of the gate was Dropbox, a storage solution for a world where gigabyte files are the rule rather than the exception, with a filing on February 23. Following close after, on February 28, Spotify, positioning itself as the music streaming analog to Netflix, filed its prospectus. With it's larger potential market capitalization and unusual IPO structure, Spotify has attracted more attention than Dropbox, and I would like to focus this post on it. 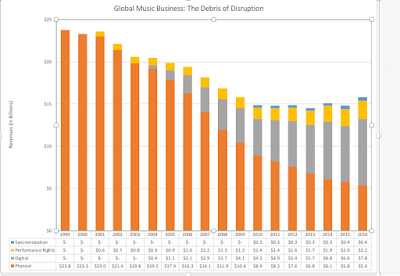 Note that not only has the move towards streaming, in proportional terms, been dramatic, but disruption has come with pain for the music business, with a drop in aggregate revenues from $24 billion in 1999 to about $16 billion in 2016. In a bright spot, revenues have started rising again in 2016 and 2017, and it is possible that the business will rediscover itself, with a new digital model. Spotify was not the first one in the business, being preceded by both Pandora and Soundcloud, but its success is testimonial to the proposition that the spoils seldom go to the first movers in any business disruption. Explosive Growth: Spotify is coming off a growth burst, especially since 2015, in both number of users and revenues, as can be seen in the graph below. Revenues have increased from 1.94 billion Euros to 4.09 billion Euros, reflecting both a growth in subscribers from 91 million to 159 million, and a change in the composition, with premium members climbing from about 31% of total subscribers in 2015 to 45% of subscribers in 2017. 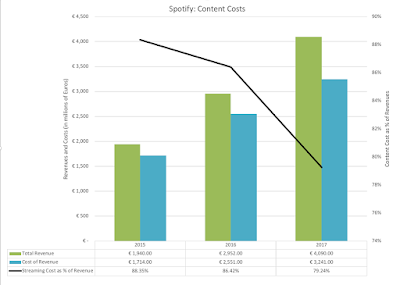 Content Costs are coming down: While Spotify insists that it is not scaling back payouts to music labels and artists, the company has been able to lower its content costs as a percent of revenues each year from 88.7% of revenues in 2015 to 79.2% of revenues in 2017. In fact, Spotify has conveyed to investors that its intent is to earn gross margins of 30%-35%, implying that it sees content costs dropping to 65%-70% of revenues. There is an inherent tension here between what Spotify has to convince its investors it can do and what it tells the music industry it is doing and the tension will only intensify, after the company goes public. Other costs are trending up: There are three other buckets of cost at Spotify -R&D, Selling & Marketing and G&A- and these costs are not only growing but eating up larger proportion of revenues. If there are economies of scale, as you would expect in most businesses, they are not manifesting themselves in the numbers yet. The collective load of these expenses are creating operating losses, and while margins have become less negative, it is primarily through the content cost controls. At this stage of its story, Spotify is a growth company with lots of potential (no irony intended) but lots of rough spots to work out. No Banks: In a typical IPO, the issuing company seeks out an investment bank, which not only sets an offering price (backed up by a guarantee) but also creates a syndicate with other banks to market the IPO, in roadshows and private client pitches. The Spotify IPO will dispense with the bankers and go directly to the market, letting demand and supply set the price on the opening day. Cashing Out: In most IPOs, the cash that comes in on the offering, from the shares that are bought by the public, is kept in the company, either to retire existing financing that is not advantageous to the firm, or to cover future investment needs. Spotify is aiming to raise about $1 billion from its offering, but none of it will go to company. Instead, existing equity investors in the company will be receiving the cash in return for their holdings. No bankers, no problem: I think that the banking role in IPOs is overstated, especially for a company as high profile as Spotify. Bankers don't value IPOs; they price them, usually with fairly crude pricing metrics, though they often reverse engineer DCFs to back up their pricing. Their guarantee on the offering price is significantly diluted in value by the fact that they set offering prices 10% to 15% below what they think the market will bear, and their marketing efforts are more useful in gauging demand than in selling the securities. From an investor perspective, there is little that I learn from road shows that I could not have learned from reading the prospectus, and there is almost as much disinformation as information meted out as part of the marketing. Control or Growth: I find it odd that a company like Spotify, growing at high rates and losing money while doing so, would turn away a billion in cash that could be used to cover its growth needs for the near future. The cashing out of existing owners sends two negative signals. The first is that they (equity investors who cash out) do not feel that staying on as investors in the company, as a publicly traded entity, is worth it. Since they have access to data that I don't, I would like to know what they see in the company's future. The second is that the structure of the share offering, with voting and non-voting shares, indicates a consolidation of control with the founders, and the offering may provide an opportunity to get rid of dissenting voices. Continued (but Slower) Revenue Growth: Spotify's success in scaling up over the last three years also sets the stage for a slowing down of growth in the future, with competition for Apple Music (backed by Apple's deep pockets) contributing to the trend. A combination of increases in subscriber numbers and a leveling off and even a mild increase in subscription per member will translate into a revenue growth of 25% a year for the next five years, scaling down to much lower growth in the years after. 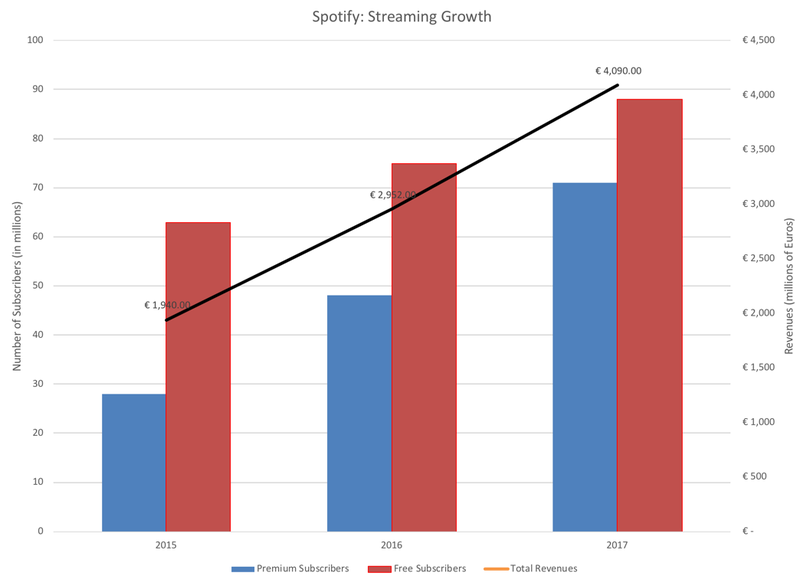 Since I am projecting revenues for Spotify in 10 years that are larger than the reported global music business revenues today, implicit in this story is the assumption that the music business overall has turned the corner and that aggregate revenues will not only continue to post increases like they did in 2016 and 2017, but that streaming will be the savior of the music business, allowing it expand its reach into emerging markets and pick up more paying customers. With Limited Capital Investments: Spotify's business model is built for scaling, with little need for capital reinvestment, except for R&D. Consequently, I assume that small capital investments can generate large revenues, using a sales to capital ratio of 4.00 (putting it at the 90th percentile of global companies) to estimate reinvestment. 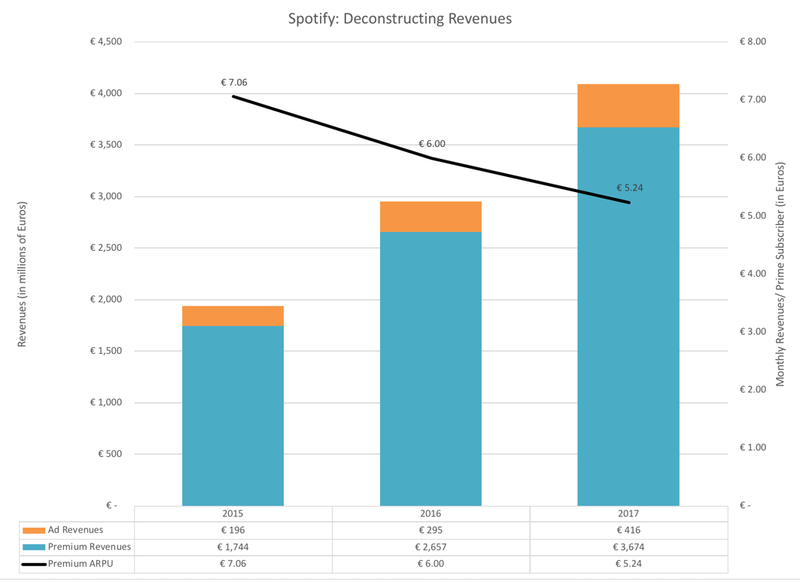 Manageable Operating Risk but Significant Failure Risk: Spotify's subscription based model and low turnover rate among subscribers does lend some stability to revenues, though adding more subscribers and going for growth is a riskier proposition. Overall, allowing for their business mix (90% entertainment, 10% advertising) and their global mix of revenues yields a cost of capital of 9.24%, at the 80th percentile of global companies; the firm is planning to convert much of its debt into equity at the time of the IPO, giving it a equity dominated capital structure. However, the company is still young, losing money and faces deep pocketed competition, suggesting that failure is a very real possibility. I assume a 20% chance of failure, with failure translating into selling the company to the highest bidder at half of its going concern value. 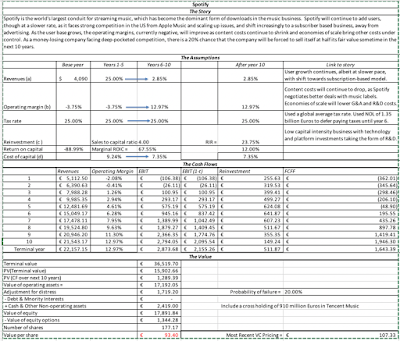 Loose Ends: To estimate equity value in common shares, I add the cash balance of the company of 1.5 billion Euros and a cross holding in Tencent Music (valued at 910 million Euros), ignore the proceeds from the IPO because of the cash-out structure and net out the value of 20.82 million options/warrants outstanding, with an average strike price of 42.56 Euros per share. Dividing the equity value of 16.5 billion Euros by 177.17 million shares (including restricted shares) yields a value per share of 93.40 Euros per share or $115.31. The shares that you will be buying will be non-voting, implying a discount on this number, though how much you discount it will depend on how much you like and trust the company's founders. It goes without saying, but I will say it anyway, that I made lots of assumptions to get to my value and that you may (and should) disagree with me or some or even all of these assumptions. 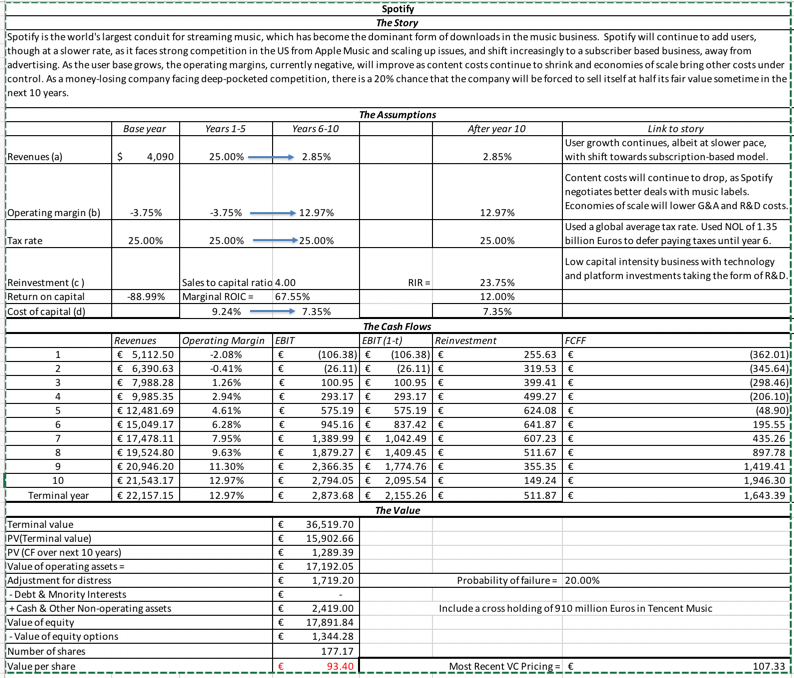 You are welcome to download the spreadsheet that contains my valuation of Spotify and make it your own. There are three elements missing in this post. First, I have argued in my prior IPO posts that what happens after initial public offerings is more of a pricing game than a value game. To those of you who want to play that game, I don't think that this post is going to be very helpful. In my next post, I will look at how best to price Spotify, why you will hear pessimists about the company talk a lot about Pandora and optimists about Netflix. Second, there is the argument that top down valuations, like the one in this post, are ill equipped to value user or subscriber based companies. I will also use the user-based model that I introduced last year to value an Uber rider and an Amazon Prime member to value a Spotify subscriber. Finally, there is the lurking question of what Spotify is learning about its subscriber music tastes and how that data can be used to not only modify its offerings but perhaps create content that is more closely tailored to these tastes. That too has to wait for the next post. I think the largest Problem Spotify is facing are his owner. All of the three largest labels own shares of Spotify and increase the license costs over time. This should continue in future and Spotify will have problems in producing stable long term cash flows. Due to this Spotify is not a safe investment. Good piece of reading, thank you. Personally I think they can reach to even lower (c. 60% content cost levels) but I find revenue growth assmps quite a challenge. Also what 16Bn USD total figure for Global Music industry seems quite low? Thanks for this analysis; I am also interested in the possibilities regarding spotify's global growth. I see emerging economies with young populations and lots of cell phones as major consumers in the 2028 streaming music marketplace, especially as global wages stagnate. An affordable service that increases quality of life will be sustained while bigger life purchases are put off. We see this already in the millennials of the united states. I am glad you mentioned the 'x' factor - data - monetizing the data generated by the aggregate and unique user profiles is the holy grail that could make spotify a unique entertainment investment opportunity. This may be where spotify can connect with artists, and potentially disrupt the musical event ticketing market as well. Would it make sense to value spotify along with the "average" publishing company? If out of a content cost of X, a portion y% goes to the artist, and 1-y% to the Sonys, BMGs etc., one should model the fact that if the streaming model succeeds, then the publisher is doomed and can only survive by setting up competing platforms, as is happening with Netflix in the video streaming world. I assume that in this scenario, the incumbents lose less revenues to competitors than they can reduce content costs by disintermediating publishers. Hello Aswath, thank you so much for your analysis and making it available for everyone. Is it possible that the decrease in per user susbcription gain is because grow in latin america? as you stated has cheaper plans. Thank you for your time and energy that you put in every work. Hi Aswath, I am not sure you covered any entry barrier Spotify Posseses. Netflix for egs tomorrow could just announce it is giving music for half the cost. What ammunition would Spotify have to relatiate and survive to be able to stay relevant.